THINK of a long-bonnet classic American truck and a few readily spring to mind - the Kenworth W-Model, Mack Super-Liner or a Peterbilt 379. However it would be fair to say that the custom-built Diamond T of Evan and Anne Williams of Brisbane also makes a strong case. The "Red Bull” is the result of a detailed rebuild over a period of two years, with the truck first taking to the road again in 2017. Evan and Anne had ventured south from Queensland and had the truck on display at the recent Lockhart Truck Show in New South Wales. Having spent a career in transport management, Evan was looking for a truck to restore as a retirement project, and after looking around, decided a Diamond T would fit the bill. "The truck we were looking for needed to look like an older truck, and my dad had operated one so I thought a Diamond T would work,” he said. With the 1966-model sporting all the mechanical componentry of the era such as a twin-stick gearbox and hydraulic brakes, Evan wanted to bring the truck up to a more modern specification underneath the cab, so a donor truck was purchased. "I wanted to be able to operate it at highway speeds so it had to be upgraded,” he said. Along with the engine and gearbox, the wiring loom, steering box and pedal assembly from the Western Star were retained, with the Diamond T now powered by a Cat C-12 which is paired up to a 13-Speed Roadranger driveline. 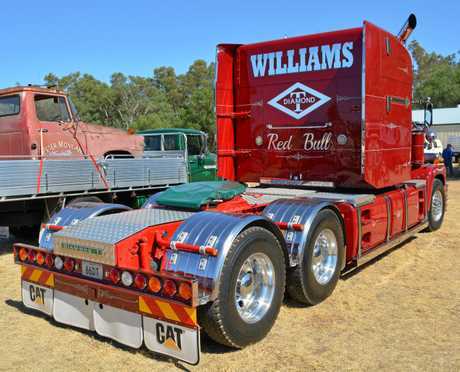 "We also found a 63-inch sleeper cab at ReTruck in Wacol and S and T Fabrications at Norwell set about doing the rebuild - Trevor "Bronco” Brehmer at S and T really knew how to think his way through the project and could cut, weld and do everything,” he said. With S and T painting the truck in a deep red finish, Evan and Anne came up with the "Red Bull” name for the Diamond T, which was a play on words from the 1970's movie White Line Fever which featured a cab-over Ford christened the "Blue Mule”. 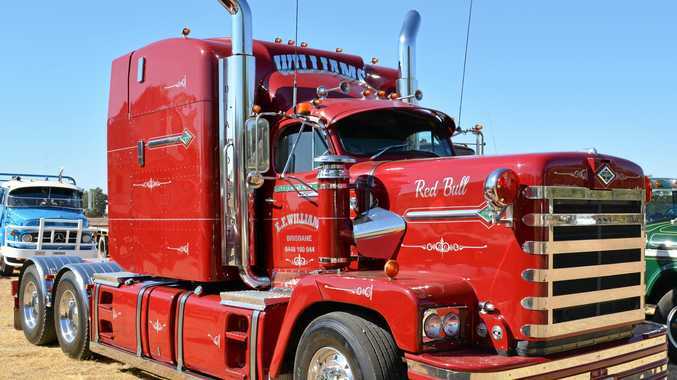 "Since we don't have mules in Australia and the truck is red we came up with the 'Red Bull',” said Evan. 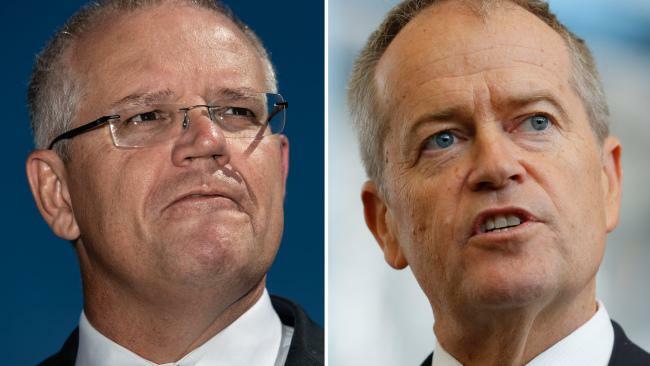 The truck was also fitted out with a range of accessories, including cruise control and air-conditioning with the big sleeper featuring two bunks, a fridge and a microwave with inverter. The rear fuel tanks have been modified to carry water with a pressure pump also fitted for keeping the truck clean. With the rear end sitting on airbag suspension, the cab also rides on airbags and a pair of air-suspended seats from a Volvo were fitted to smooth out the ride. "I was seeking out comfort and on a good road it's wonderful to drive, but that Newell Highway is still a rough ride!” Eva said. 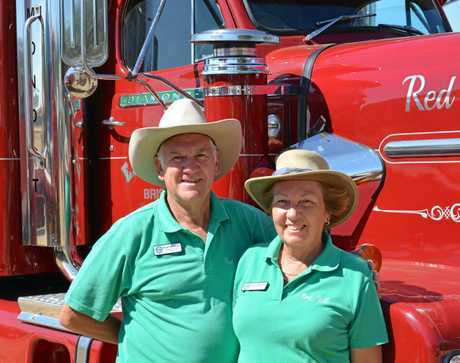 As members of the Heritage Truck Association, Evan and Anne have taken the truck to a number of shows as far afield as Glen Innes in northern New South Wales and Biloela in Queensland, and with their caravan hooked on behind the Diamond T, were making their first foray to southern Australia. "From here we will be going to the Truck and Machinery Show at Clunes and then on to the White Truck Muster at Kyabram; Lockhart was a stop along the way to maximize the exposure of the vehicle,” Evan said. Given the number of people looking at the truck in Lockhart, it will be a crowd puller wherever it goes, and Evan and Anne are justifiably proud of their unique truck. "It holds its speed, it goes up hill and down dale and it's just a pleasure to drive,” he said.